These are all ARCHIVED pages of the 30th anniversary event. Karin Bellaart from The Netherlands - was our main teacher of International Dances. Do refresh any page tab of your own, as you check for latest information. Look what WE are doing on these sunny bright mornings this weekend & join us. View the detailed programme of Dance/Song/Activities: click above to view each day. We BEGIN with a walk on cLICK FRIDAY - then International - then a sit-down roast meal. A wonderful Geoff Cubitt Contra follows: bourées for LNE. Copyright James Hobro 2005. CLICK pic. to enlarge. In 2013, hope for Morris in the sunshine: Maypole dancing out on the green & patterns through the daisies. Join to play music, share Song, ring handbells & much more. Many are experienced in some aspect of dance/music: We have skills to share. Join and participate with us in the dancing, music & song. Pete Grassby shows simultaneously his skills both as dancer AND Musician: whilst he waltzes with Linda Moon. The melodeon & its straps are closely around Linda's back. Pete you hear entertainingly to remark "She can't get away".Visit Pete Grassby's website - or that of Coventry based Aardvark Ceilidh Band which Pete leads (and founded). You'll find Morris Dancing, Song groups and Handbells outside when we have sunny weather! 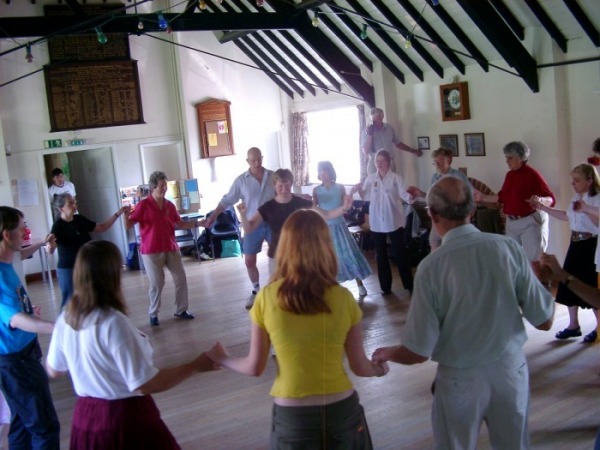 At popular times, these parallel workshops take place while there is dancing in the hall. Workshops in dance, music, song & much more : through the day on Sat, Sun, & Monday. Nel from The Netherlands shows some International Dance steps. Activities take place in a lovely area of English Warwickshire countryside. 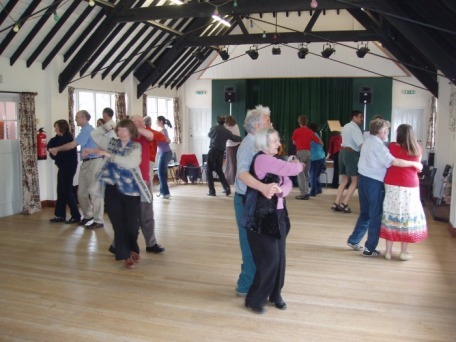 The excellent floor of the villages' World War I Memorial Hall allows comfortable dancing in pleasant surroundings. You are most welcome visiting singly: Equally with a partner. Nel van der Laan guides (above) Karin Bellaart made several visits too: also Emmie Buisman and Mariette. NB Sides of the hall are NOT a safe place for personal items, or to set-up chairs ! Paul and Nicola, on a small committee, have shared in the tasks, especially preparation & finance. This enabled its 29th year to have been successfully completed. It will continue to be available - for the participatory enjoyment of the many who take part. André sincerely appreciates these two friends who have taken on much "spadework" in our small team. now with an even further extended committee - to be a continuing reality through into the future. 1) To foster contacts ABROAD. To promote friendship & understanding through sharing folk dance, music & song. 2)To give opportunities for dancers, musicians and everyone coming to try out different skills. It's a chance for you to try doing something new! So when you visit for a particular dance or workshop, why not come sooner and sample something else too. Or perhaps instead, stay to sample what comes next. No matter if the standard seems to be high. Better dancers/musicians/singers are there to SHARE their skills. And do please bring an instrument to try a few tunes in the friendly company of one of the music workshops. "Great Alne" is organised as an opportunity to discover, exchange to pass-on these joys & skills. That is to be found in active participation in all kinds of folk dance, folk music and traditional songs. Allowing everyone to enjoy the activities, and to be able to sample something different. The PRICE STRUCTURE tries to reflect these principles. The workshop leaders are not paid. - Most leaders who regularly contribute just enjoy the weekend by participating in the workshops of others. Please generally take back a chair you've used as you get up to leave it. Wish to bring a caravan? Preferably leave YOUR name/tel contact. See Caravan/Motorhome page. The 2009 Great Alne website still has some archive interest. cLICK here. This will take you across to our older website layout Great Alne 2009's Home Page.